Do you hear that in the distance? The faint murmurings of converting custom elements and third-party schematics are growing louder as the ng-Nepal conference draws closer. Heralded as the largest Angular gathering to grace Nepal, its advent on July 21st aims to bring together a vast array of respected authors and speakers to dive into the world of Angular. Broadcast live in five major cities across Nepal, there are 130 developers attending the day to listen to in-depth Angular talks spread across eight highly respected speakers. The talks will range around topics like working with forms in Angular, customizing attribute directives, and increasing the performance of an Angular application. With the conference sponsored and partnered with by over twenty major tech companies, like Infragistics, Microsoft, NPCERT, Subisu, and QuestPond, the organizers of the event worked to create an extensive conference set to help participants learn. Infragistics’ own Dhananjay Kumar was an integral piece in bringing the conference together and is a three-time speaker at the event. His talks will elide closely to some of his most popular articles, introducing attendees to Ignite UI for Angular, holding an in-depth Angular session, and speaking to change detection in Angular. Along with Kumar’s talks, every attendee at the conference will receive and Ignite UI for Angular promo code through their email, allowing them to jump-start their Angular projects with the fastest Angular data grid in the world. As the conference moves throughout the day, make sure to follow the updates on Twitter with the hashtag, #ngNepal. 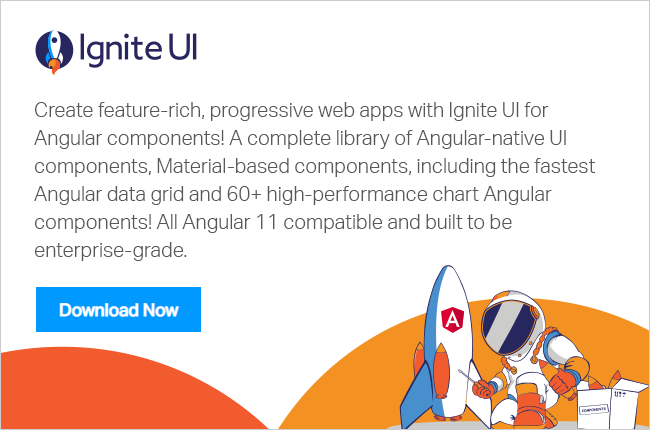 Also, you can follow Infragistics for the latest Angular updates and check out the newest features added to Ignite UI for Angular’s powerful component suite.